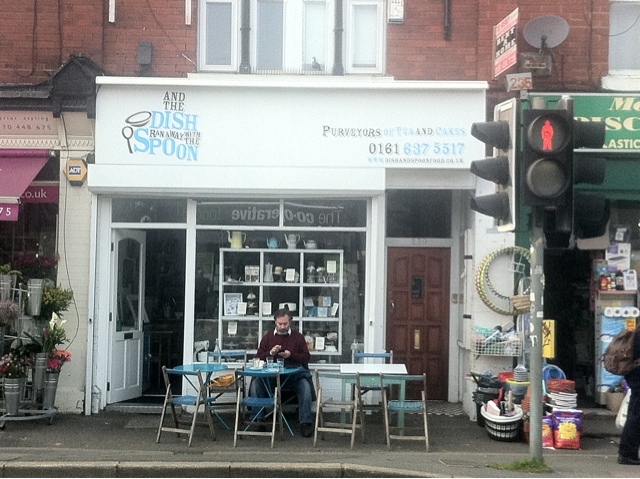 Laura: The Dish and Spoon has a real seaside vintage feel with a mix of cornflour blue hues and natural tones. I found the retro kitchen quality to the tea room to be very inviting with the various jars and utensils on display along with the folddown table tops and old fashioned sweet jars. 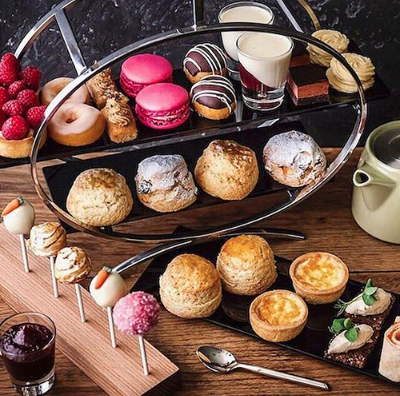 We visited on a particularly quiet afternoon so it was difficult to judge what kind of atmosphere it projects but I can imagine that with its petite and intimate design it would create a really friendly environment when full of tea and cake lovers. Caroline: Simple and sophisticated, Dish and Spoon provides the perfect environment for a relaxing afternoon alone or with friends. Decorated throughout with blue and wooden themes, this cafe emits a tranquility which is rare within the city, providing a calmness characteristic of a rural or southern coastal town. 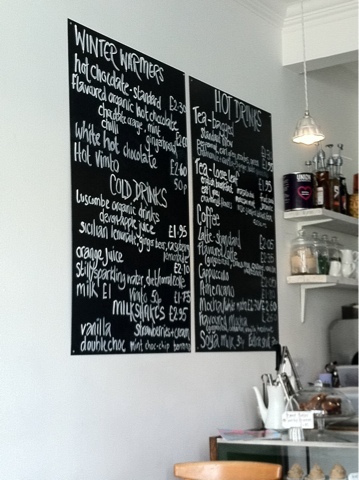 I particularly liked their blackboards and old fashioned scales, which really gave the place a quaint, homely feel. 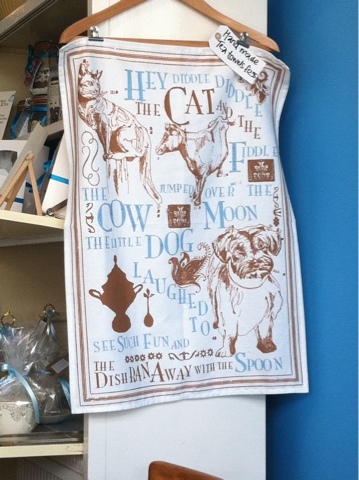 I can also highly reccommend their personalised memorabilia, which can be purchased in store and has some of the nicest designs I've ever seen - especially their tea towels! Laura: Oh what to do when every cake in an entire shop looks so yummy? 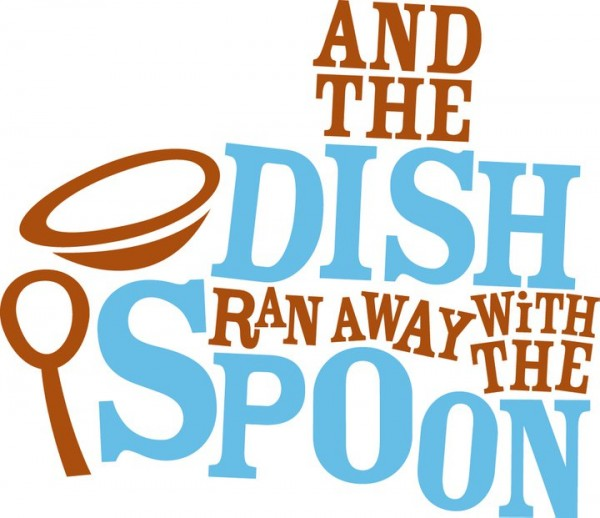 I’ve had a real obsession with peanut butter buttercream lately so my decision was made when I saw that they had a cupcake with this on top. 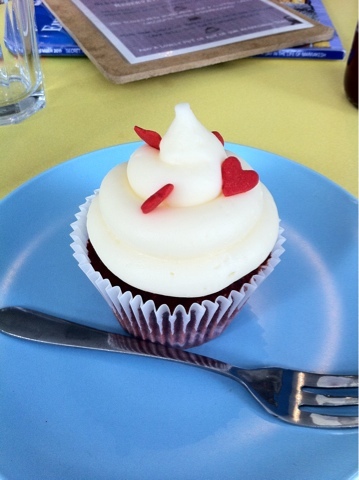 It was absolutely lovely, deliciously moist and the buttercream with chopped nut sprinkles was perfectly smooth. I chose a bottle of raspberry lemonade to go with my chocolate treat which was a refreshing change from usual drinks menus and definitely added a special touch. Caroline: A while ago someone told me to try red velvet cupcakes, so when I saw that Dish and Spoon were selling them, I had to taste one. It was YUMMY and I especially loved the cream cheese topping - which I'm definitely going to try when I make some of my own cakes soon! 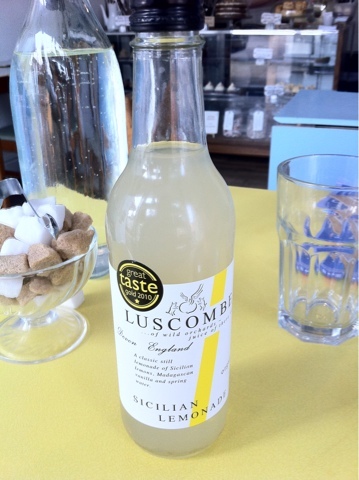 To accompany my cupcake, I chose a sicilian lemonade which was just perfect for a warm spring day. Laura: We were assisted promptly at the counter and our food was brought to our table which I personally believe makes a world of difference to a tea room experience. We were greeted with the upmost of manners and a smile, something very high up on my checklist! Caroline: Once again, I have no complaints in this department. The service was pleasant, friendly and efficient - Very well done! 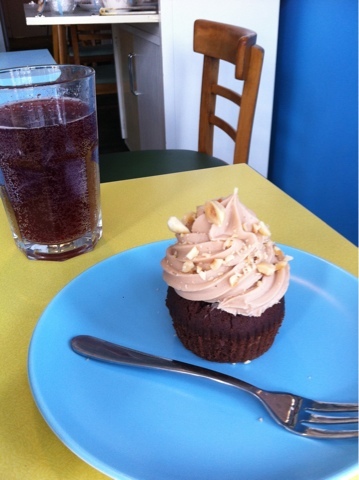 Laura: I thoroughly enjoyed our visit and thought the cupcakes were just delightful. The tearoom itself is pretty but not too over the top with vintage accessories, which for a quick cake and coffee pit stop, makes it the ideal place to be. 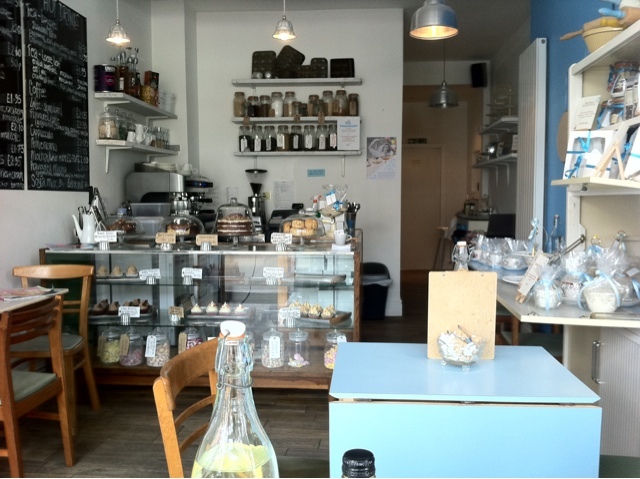 Caroline: This place is a perfect retreat from the hustle and bustle of city life, and with its nice cake, good service and relaxing environment, I wouldn't hesitate to visit again! I bought a brownie from here once and thought "How much, this better be worth it", it was.